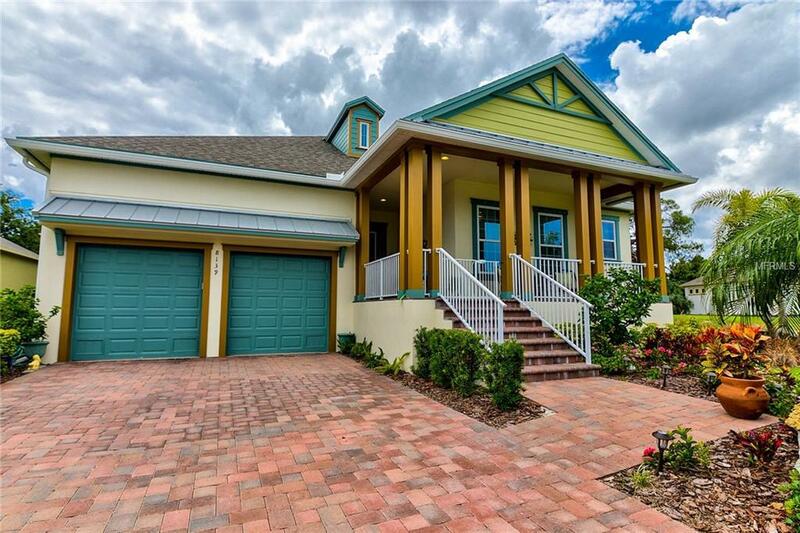 Welcome home to your coastal retreat in the boutique community of Palma Vista. The interior beckons you with a calm & cool custom paint color palate along with beautiful hardwood floors that flow through the living areas. The kitchen is the heart of the home in this open floor plan with a large island & dining area ideal for entertaining. Quartz counter tops & tile backsplash in sea glass colors add to the coastal ambiance. The master suite has a luxurious bath featuring a long vanity with dual sinks, large shower & walk-in closet. A separate den overlooks the pool, an ideal home office. Upgrades throughout include; crown molding, 5 1/4 baseboards, tray ceilings, designer blinds. Relax by the heated Pebble Tec pool with waterfall feature & travertine deck with ample covered space in a private setting. Newer construction offers energy features modeled through the Power House Green requirements. Charming curb appeal with coastal exterior details, paver drive & your elevated paver deck front porch is the perfect spot to watch amazing sunsets. Enjoy the tropical landscaping without the work as your ground maintenance is included in the HOA. The spacious garage has epoxy floors and offers tandem 3 car parking or work space with high ceilings for plenty of storage options. A neighborhood path leads to a private gate with access to nearby 20-acre Palma Sola Park, with playground and sports fields. Desirable location next to Palma Sola Bay & minutes to gulf beaches, shopping, restaurants & medical facilities.